In 2003 I moved to Hollywood to become, let's be honest, a star. While waitressing, going to auditions, and pursuing a cliche (but worthwhile if it comes true) dream that thousands of others share (about 10,000 new dreamers arrive in LA each DAY!) ... I was financially challenge aka broke. So, for Christmas, I baked cookies for all my new Jewish friends I'd made in Los Angeles, most of whom worked in the music Industry. Long story short, they loved my cookies and told me I should sell them so I did. First by word of mouth, then online, and finally to 10 different wholesale accounts around LA, including Whole Foods. I called my little homegrown company Cookies Couture and prided myself on using the best, most unique ingredients the cookie world had ever seen. The good news ... people loved them! The bad news ... I was only 22 and began without a business plan or a lot of funding. For a few years I waitressed and ran the company, and was just breaking even. After consulting my heart, my head and my, let's be honest, parents, I decided I had to shutter the cookie biz for the time being, get a "real" job and learn more about the business side of the high end bakery world. It's 2010 and I have yet to resurrect Cookies Couture, but I do bake often and this recipe was my best seller! 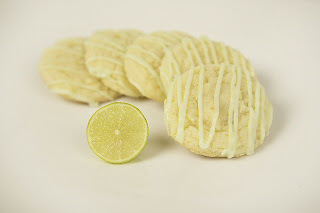 Even if you don't like key lime, you very well may love these cookies. There are also super simple to make. Using an electric mixer, cream together the butter and sugar until light and fluffy, about 3 minutes, scraping the bowl down as needed. Add egg yolk, zest, vanilla extract, key lime juice, and salt and mix on medium speed until combined, about 1 minute. Add flour and mix until just combined, scraping down sides as necessary. Transfer the dough to large piece of wax paper. Form into ball, wrap and refrigerate for 30 minutes or freeze for 10 minutes. Preheat the oven to 350 degrees F. Line 2 large baking sheets with parchment paper, Silpat, or tin foil and set aside. Use a 1oz. ice cream scoop or small spoon to scoop dough into balls and place on baking sheet 1 1/2 inches apart. Bake for 8 to 10 minutes, rotating sheets half way through if your oven does not bake evenly. Remove cookies before they begin to brown. Remove from oven and let cool fully before icing. For the key lime icing: In bowl of electric mixer, combine the powdered sugar, key lime juice, vanilla, and salt. Using whisk attachment, whisk until smooth. Scrape down sides as needed and add more water or sugar as needed to create drizzle factor. Add food coloring and whisk until coloring is even. Fill piping bag or zip lock bag with icing and snip off tip to make a tiny hole for drizzling icing back and forth over cookies. Once cookies are iced, let dry at least one hour before packaging. This sweet and savory game hen recipe was one of my favorite from cooking for the cast at the If I Can Dream House. It's fairly simple but looks impressive on the plate and is perfect for a small dinner party. I like to give each person their own hen, as I think it makes a more dramatic statement, but you can cut these in half. I served them with wild rice, pecan and cherry stuffing ... a healthier version of "Grandma's Stuffing" that is every but as comforting and satisfying. Make this dinner when you feel like preparing a min-version of Thanksgiving that will please most any palate. Note: I don't wash my poultry or meat before cooking it as many do. Jacque Pepin believed, if the heat that cooks the meat isn't strong enough the kill any bad bacteria, you don't want to eat it anyway, and I agree with him! Washing your poultry or meat in the sink can spread bacteria through cross contamination so, it's best, in my opinion, to leave it untouched until it's ready to be cooked, then throw away packaging immediately.) See more from experts here. Prepare large roasting pan (with rack if you have one) by spraying it with oil, set aside. In small bowl whisk together olive oil, salt, pepper, and Turmeric. Use basting brush to smother hens with olive oil mixture. Roast hens for 25 minutes. While hens are roasting, in medium bowl,whisk together BBQ sauce, marmalade, preserves, lime juice, vanilla, and cayenne. Reduce oven temperature to 350 degrees F (175 degrees C) and baste hens with BBQ mixture. Continue roasting for 30 minutes or until hens are browned and juices run clear when breast is pierced with knife. Baste with BBQ mixture every 10 minutes. Remove from oven and let sit 10 minutes before serving. No carving needed! Wild Rice Stuffing with pecans and cherries recipe coming soon! Foodie, Flirty L.A. Girl with a sweet tooth. I'm giving a lecture - Rome: a culinary history tour.